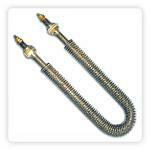 We manufacture custom designed process air-, gas- and convection heaters, air duct heaters, finned elements . Most of our heating solutions are employed in heating of air or other gases in ducts, autoclaves, or ovens for many industrial heat applications. For instance, our designs optimize the heating of air fed into combustion and prevent condensation. 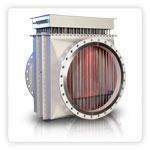 Sheathed tubular, finned tubular, and finned strip elements consistently outperform gas, oil, and open coil electric units in both heating efficiency and safety. View products! Browse our catalogues for standard air heaters commonly requested & add products of interest to your "enquiry list" or contact us to discuss your requirements. Low to high temperature/ high flow rate heaters are available for Climatic Control, Drying, Curing, Baking, Processing, Preheating, Shrinking, and Thermoforming are frequent applications. our sensors and controls are available to provide single-source heating systems suited to your commercial heating application. Low to high temperature/ high flow rate heaters are available for climatic control, drying, curing, baking, processing. Elements are secured to the mounting plate by clinched bushes, allowing easy replacement of individual elements. A terminal cover protects the termination of the array. The array can be immersed directly into the duct. For high temperature heaters, low wiring compartment temperature is ensured by a thermal insulation layer above the mounting plate and an additional air gap between the termination area, allowing natural convection to further cool the rods. Finned elements are used where space is limited and high heat transfer rate is required. We supply a wide range of finned rod and stripped elements - both standard as well as to customer specifications. Rod elements offer economic and robust heating for general purpose applications. They can be bent to any suitable shape and are mounted in ovens (still air) or in ducts (forced convection). Elements are available separately for use in OEM equipment. Special materials and custom designs are available for marine applications, power plants, or hazardous applications.